Sweaters beat pajamas (jammies) any day) so I figured this is a perfect Blogger Blast! Florida is finally feeling the chill so maybe you can envy the Sunshine State a little less, when you are wearing snow boots and shoveling snow from your driveways. This past week not only have I purchased a sweater, I have actually started wearing long sleeves. Not just for outside either because I live in a house that gets really drafty around this time of year so I like to wear sleeves to keep the cold chill off me. It's a nice change from the Sports bras covered with loose fitting Toppers I sometimes wear to work at Stein Mart. The online preview of our 14 hrs sale is available now. 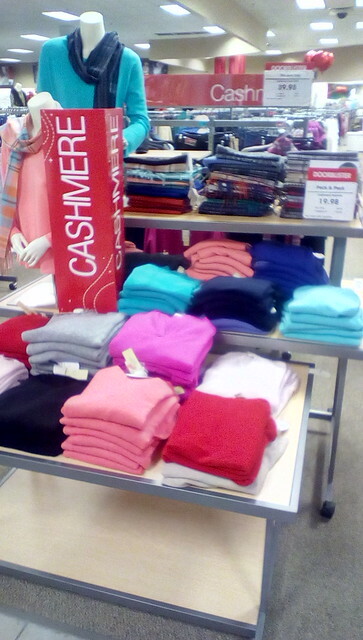 The good news is that these soft and gorgeous sweaters are listed as a doorbuster so you get like a $20 discount. As you can see from the photo, the color selection provides choices for every personality and mood. Right now I'm feeling like a navy or a red. What about you? Godiva Chocolate is for more than stuffing stockings but why not? Get your Godiva at Stein Mart.